Four-time champion Ronnie O'Sullivan says he may have to pull out of the UK Championship after breaking his ankle. The 39-year-old suffered the injury while out running in Essex this week and wore a protective brace in beating Daniel Wells 6-2 in the first round. To add to his problems, he faces being fined by the World Professional Billiards and Snooker Association after being reported by World Snooker for swearing four times during his media conference. O'Sullivan hobbled into the arena at the York Barbican and was grimacing throughout his match against Welshman Wells, but he closed out victory after being pegged back to 2-2. 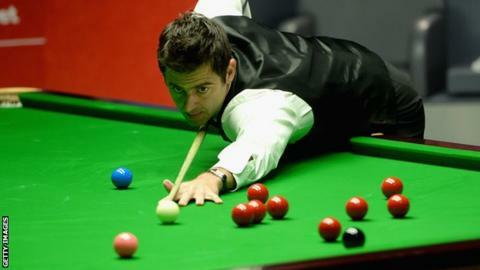 The Englishman is not due back in action until Sunday evening, when he is set to play Peter Lines in round two. The five-time world champion had taken painkillers and was wearing soft shoes and a protective brace but was still struggling. He added: "It is swelling up and it is painful. I took all the painkillers I could but if it is not better by Sunday then I probably won't play. "I am absolutely gutted. I am really enjoying my snooker more than ever. To do that through running, I am just really angry with myself. "I think I will stop running until my snooker career is over. I wanted to see what happened but I was all over the place." O'Sullivan had initially thought he had badly twisted his ankle when he slipped and fell while running in a forest with a friend. On Tuesday, he wrote on Twitter: "Might be one legged snooker at the #UKChampionship on Thursday."